Compiled from Dr. Wiersbe?s best-selling ?BE? series with over 3 million copies in print! Here at last is the exciting truth of the Old Testament Scriptures wrapped in the warm, personal style of one of America?s best-loved Bible teachers, Warren Wiersbe. 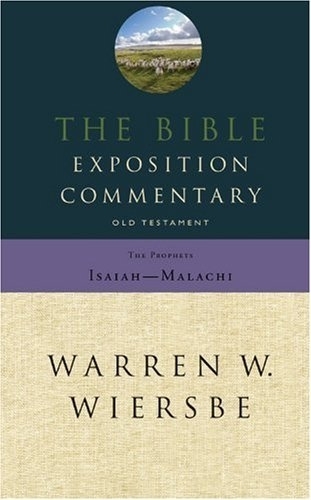 Dr. Wiersbe brings the people, places, history, and teachings of the Old Testament prophets to life in the pages of The Bible Exposition Commentary. This volume is compiled from the following ?BE? series books: Be Comforted: Isaiah; Be Decisive: Jeremiah; Be Reverent: Ezekiel; Be Resolute: Daniel; Be Amazed: Hosea, Joel, Jonah, Nah., Hab., Malachi; Be Concerned: Amos, Obadiah, Micah, Zephaniah; Be Heroic: Haggai, Zechariah; and the previously unpublished study of Lamentations.This is the latest addition to the Bible Exposition series, which includes the Pentateuch and the two-volume New Testament set. Two subsequent Old Testament volumes will follow, covering the Historical Books and the Wisdom and Poetry Books.Study the Prophets in digestible sections that emphasize personal application as well as biblical content. It?s the commentary that doesn?t read like a commentary but likeletters from a good friend.